Magpul's PMAG M2 MOE Window AR-15 Magazines are identical to the original time-tested and combat proven Pmag, with the only difference being that the Pmag's optional impact/dust cover is not included. The M2 MOE Window Pmag is constructed from advanced polymers that are light weight and exhibit superior impact resistance. It incorporates a transparent Mag Level window on either side of the body to provide the shooter with an approximate determination of ammunition remaining in the magazine at a glance. 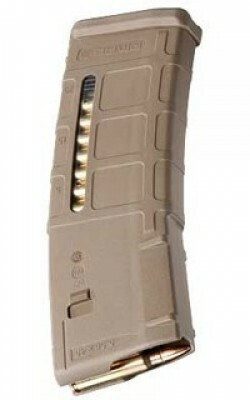 The 30-round magazine features a constant curve interior profile for enhanced feeding of cartridges. A 4-way anti-tilt follower and high quality stainless steel spring ensure reliable feeding, while the magazine body's distinctive, "slim" ribs and flared floorplate improve handling over conventional metal-bodied magazines.